Island Peak is one of the most popular trekking peaks in Everest region, which allows travelers to scaled mighty 6189m without any basic experience of climbing and mountain gears. It is also one of the most commercial peaks of Nepal and thousands of travelers add theirs once in a life trip to Everest Base Camp Trekking with Island Peak Climbing. 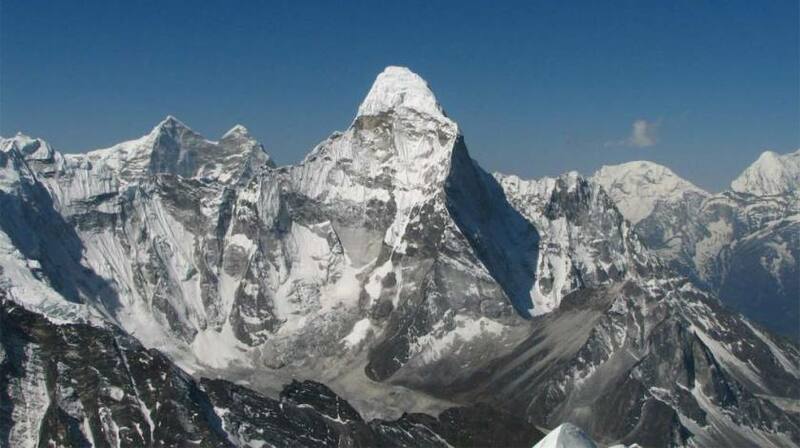 Island Peak was first time climbed in 1953 by a British Expedition Group as training for Everest Expedition. Popularly known as “Imja Tse”, climbing Island Peak has been a great adventure for many trekkers who wish to feel little more thrills around the glaciers and ice covered trails to test their strength to reach the top of any mountain. This 15 days Island Peak Climbing route is designed for travelers who are physically fit and ready to take a direct short-cut towards the peak rather than visiting nearby popular Everest Base Camp for acclimatization. However, we will climb Chhukung Ri (5500m) at Chhukung Valley for acclimatization, and check our physical condition before stepping towards Island Peak Base Camp. Climbing Island Peak needs three total days of ascending and descending and it is strenuous but the reward is something amazing — a majestic panorama of the world highest range including Mt. Everest (8848m), Makalu (8463m), Lhotse (8501m), Nuptse (7864m), Lhotse Shar (8386m), Baruntse (7129m), Ama Dablam (6814m), Peak 29 and several others stretched to the east. Island Peak climbing starts with a scenic flight from Kathmandu to Lukla and ascends towards the Gateway of Everest — Namche Bazaar after spending the first night in Phakding village. The journey continues towards Tyangboche Monastery and later Dingboche village from where we stop following the popular EBC trails and turn right into the Chhukung Valley. Our guided climbing team with all the needed equipment will help you acclimatize by climbing Chhukung Ri at first and later provide instruction about the use of gears and technicality of the route. After the successful summit, we follow the same route back towards Lukla to catch our flight back to Kathmandu. Arrival Pick Up: Welcomed by our representative on arrival at Kathmandu Airport and transfer to the accommodation facility accordingly. Departure See Off: We shall arrange your final departure towards International Airport on private vehicle hoping to see you someday in arrival section again. Carryin Staffs to support the luggage of trekkers. They are strong to carry for two trekkers’ luggages, which is best-minimized upto 20 kg in total. All Nepalese Crew members’ salary, food, flight, accommodation and most importantly, insurance of each are already covered. Trekker’s personal gears and equipments are NOT INCLUDED. You can also obtain Arrival Visa at Tribhuwan International Airport, Kathmandu. Multiple entry visas are USD 25, USD 40 and USD 100 for 15 days, 30 days and 90 days respectively. No travel insurance of any kinds is included for trekkers. You should buy yourself a travel insurance that suit your adventure activities and cover possible expenses (Our Crew are Insured). Any other excursion or adventure plan besides mentioned above is not included however; they can be arranged happily upon your interest on extra cost. Your safety is our top concern while organizing outdoor and adventure plans. Our leaders and crew members are experienced professionals who will make sure that trip is safely coursed. We truly understand the essentiality of information flow and risk management to provide the best experience. Our trekking arrangement includes the proper clothing, supplies of equipment and gears, high altitude prevention measures and remedies to provide the carefree adventure in the Himalayas. Standard itinerary and route plans are typically designed considering the average level of fitness of travelers and level of altitude gain on the trek (and multiple other factors) which can be modified as per the interest, time and budget plan of travelers. There is always a room for customization of the given standard itinerary if it does not meet your way of interest and then please pass your opinion. You may want to stay in Kathmandu by yourself or maybe do sightseeing around by yourself; we will give you more information to do it by yourself if you ask us. We always like to hear what you have to say. We are always happy to assist your valuable travel holidays in your manner with the best information that suits your way of traveling. It is your travel plan; you can choose what you want to do, of course with a lot of information first. Feel free to submit and share your travel ideas and we shall get back to you with more thoughts in no time. We, ourselves feel that the group size of maximum 12 pax is an ideal size to run the trip. However, we have also arranged the plan for large students groups, employee groups and able to organize such trip for groups upon request. All of our trekking plans are accompanied by specialized local leaders, guides, porters and assistant guides (as required) who will always ensure your safety and comfort at every part of the journey.